In a year that’s seen the company roll out two updated tractors and a futuristic concept tractor-trailer, Volvo Trucks North America said Monday it’s readying itself for the future of freight transportation. In a press update held at the North American Commercial Vehicle Show, Volvo recapped its busy year of updates, offering a bird’s eye perspective of what the new technology means for the trucking industry and its future. The company unveiled this year a refreshed VNL tractor for the long-haul market and a new tractor, the VNR, targeting the regional-haul segment. In March, the company debuted its SuperTruck tractor-trailer, a $40 million venture built via a partnership with the U.S. Department of Energy. The Volvo SuperTruck achieved a 12 mpg average, and Volvo brought features developed as part of the SuperTruck’s research and development to its current product line. Its 2017 D13 engine brings 7.5 percent better fuel efficiency than its 2014 predecessor, said Volvo’s Magnus Koeck, VP of Marketing. The engine leans on features like turbo compounding, a form of waste heat recovery, and wave pistons to achieve its fuel economy gains. The long-haul tractor powered by the D13, Volvo’s new VNL, also “takes another step” in fuel efficiency, says Koeck. “This isn’t a 6 mpg truck anymore,” Koeck says of the sculpted aerodynamic unit. The VNL also features new exterior stylings, like an updated grille, and a refreshed and driver-focused interior. The company will be showing off the new VNL in a truck stop tour taking place between Oct. 3 and Oct. 14 in select truck stops across North America. Volvo also said it’s pressing to connect more Volvo trucks to its Remote Programming platform, which allows over-the-air software updates and engine repogramming. The system aims to cut downtime and make it easier for Volvo trucks and engines to maintain up-to-date software. Currently, about 135,000 trucks are connected to the system, says Volvo. The company made its remote diagnostics system standard in 2012. It launched the remote programming element earlier this year. Eyeing the future of transportation, Volvo’s Keith Brandis said the company is investing in three key technology areas — connectivity, electrification and automation — as well as the convergence of the three, which will create a “dramatical future,” says Brandis. Such technologies are still in a fledgling state, says Brandis, and much work needs to be done in the public and private sector before these systems come to market. But technologies like electrification, automation and connectivity can solve some of transportation’s most pressing issues, such as congestion and gridlock, as well as safety. This entry was posted in Automation and tagged 3pl, future, product, tractor, trucking, vehicle, volvo on September 26, 2017 by ReedTMS. American Trucking Associations kicked off National Truck Driver Appreciation Week, a week-long celebration of the trucking industry’s 3.5 million professional truck drivers. Running Sept. 10-16, National Truck Driver Appreciation Week highlights the efforts of professional truck drivers to remind the industry of the important role that truck driver’s play in transporting goods across the nation. More than 80% of U.S. communities rely exclusively on truck drivers to deliver goods and commodities, and some remote towns and territories are unreachable by other modes of transportation. ATA is asking the trucking industry to engage their communities in this week’s celebration of truck drivers. 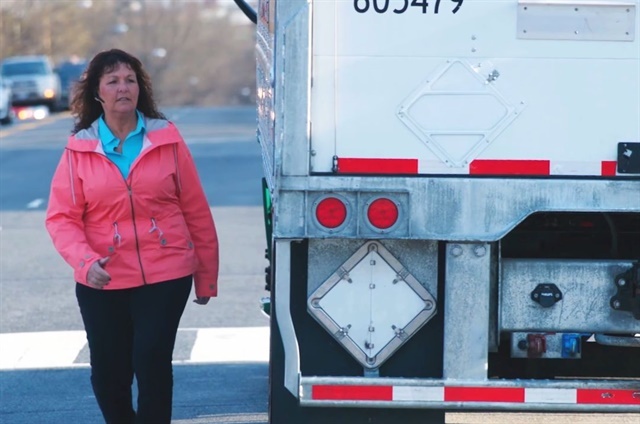 Public officials, community leaders, members of the media and local businesses can all play a role in helping to better understand the important work that truck drivers do in safely moving the economy each day. Highway safety is dramatically improved when the motoring public acknowledges the difficulties of driving a truck and the limitations of large commercial vehicles. In support of this effort, Trucking Moves America Forward, the trucking industry’s image movement, is partnering with state trucking associations to run billboard advertisements along key highways to thank truck drivers for their service to the industry. This year, special attention is being paid to the 1.6 million trucking industry employees who live and work in the direct paths of Hurricanes Harvey and Irma. During National Truck Driver Appreciation week, ATA is monitoring the storms and working with FEMA and the American Logistics Aid network to carry out relief efforts. State trucking associations, industry suppliers, and carriers are set to host appreciation events for the men and women who safely deliver more than 70% of all freight tonnage in the United States. Additionally, America’s Road Team Captains and Share the Road professional truck drivers will take to the airwaves Sept. 12 for live satellite broadcasts from the Nashville terminal of TCW. ATA first vice chairman Dave Manning, president of TCW, will participate in the morning broadcasts and speak alongside the professional truck drivers about the important role that drivers play in the nation’s economy. The ATA official NTDAW site offers a collection of resources to magnify driver appreciation events. The content provided by ATA allows industry professionals to engage their communities during this week of outreach. These resources are aimed at demonstrating public support for the work that drivers do each day and reflecting the image of professional truck drivers. This entry was posted in Trucking News and tagged 3pl, ata, Driver appreciation week, drivers, reedtms, trucking, trucks on September 13, 2017 by ReedTMS. ReedTMS August 2017 Employee of the Month! Congratulations to Alexis Hardy and Jason Gensrick, ReedTMS Logistics’ Employees of the month for August. Alexis and Jason both have an incredible amount of work ethic. They continuously are willing to help in areas where the business needs them. “She comes in and WORKS! It’s 10 toes down, grinding type of work. The kind of stuff that most would turn their nose too. The type of stuff that most have opinions over sitting down and actually covering loads. Thanks for all you do Jason and Alexis, keep up the good work! This entry was posted in Prize Wheel and tagged employee of the month, PRIZE, reedtms, Wheel Winner on September 8, 2017 by ReedTMS.